Seller Fulfilled Prime is an Amazon program that allows qualified sellers to display the PRIME badge on orders fulfilled via their own warehouse or a third-party fulfillment provider (3PL). In this quick-read eBook, we summarize the PROs and CONs of the program to help you decide if it makes sense for your business. For online retailers, processing and delivering orders eats up a huge chunk of operating expenses. That’s why it pays to know as much as you can about this critical function. This eBook provides a crash course in fulfillment operations to help you control costs, increase customer satisfaction and improve profits. For online sellers working with outside fulfillment partners, it is essential that they have a clear way to measure the performance of the fulfillment warehouse. This easy-to-read eBook covers typical mistakes and offers 10 tips to help. How Many Warehouses Do You Really Need? To keep your online business competitive, you may believe you need to match the reach and speed offered by Amazon’s logistics arm, Fulfillment By Amazon. But do you, really? This paper looks at seven questions to ask when deciding how many warehouses you need to strike the perfect balance between delivery time and cost. For eCommerce and direct selling companies, the lower you drive fulfillment costs, the more profit you drive for the business. Your biggest bang for the buck is going to be parcel shipping costs, which can account for as much as 75% of total fulfillment costs. What keeps so many online sellers from turning their businesses into true revenue and profit machines?The answer is that many more eCommerce companies get fulfillment wrong instead of right. 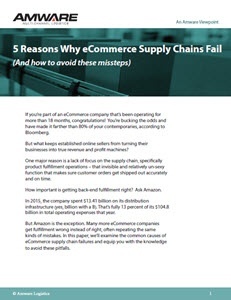 In this quick-read eBook, we’ll examine the common causes of eCommerce supply chain failures and equip you with the knowledge to avoid these pitfalls. 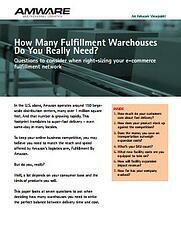 Is Fulfillment By Amazon Right for Your Business? While Amazon.com is an incredibly powerful sales channel, FBA may not be the best fulfillment partner, particularly for companies that want to manage the brand experience, preserve margin, and quickly adapt fulfillment processes. Online sellers need to go into any relationship with FBA with their eyes WIDE open. This quick-read eBook hits on 5 FBA limitations that should be considered before pressing the BUY button. Fulfillment companies unfamiliar with direct selling and multi-level marketing (MLM) businesses may struggle with some of the unique requirements to serve this market. 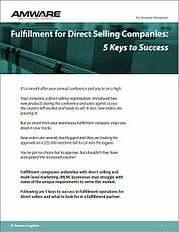 This eBook covers 5 keys to success in fulfillment operations for direct sellers and what to look for in a fulfillment partner. inventory, warehouses and information systems. 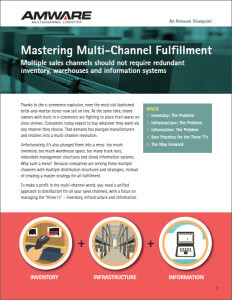 This paper review best practices for managing inventory, infrastructure and information in a multi-channel environment. 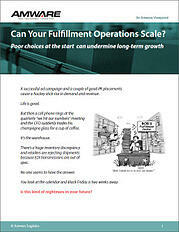 Can Your Fulfillment Operation Scale? 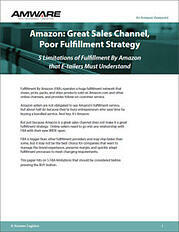 Growing companies don’t think far enough ahead about the implications of growth on fulfillment operations. That can backfire if the operation can’t meet the needs of the business as it expands. This paper explores common fulfillment mistakes businesses make in the early stages of their growth, and alternative approaches that are scalable, affordable and low-risk.